If you think that my LED tutorial is too complicated to program a simple LED, then this article might be of interest for you. Because there is an easy and basic way: And I mean it: really basic. And the name is the program(ming language) ;-). The great thing with the build-in BASIC ROM was that you immediately can start programming: no compiler or special IDE needed: simply type in your program and run it! Awesome simple and intuitive, especially for beginners. And of course there was plethora of software and game available too. Download the CoreBasic Freedom Board CoreBASIC firmware (binary file). 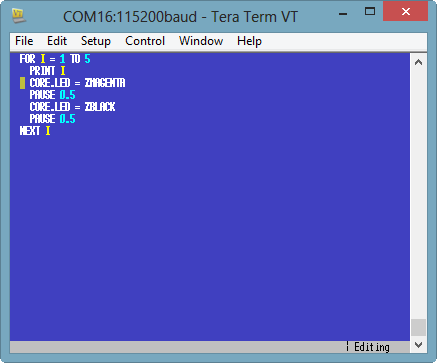 A terminal program capable to emulate VT100 or later because CoreBASIC is using control character sequences e.g. for color information. A good choice in my view is TeraTerm. turns the RGB led to blue, then to green and finally to black (well: off). 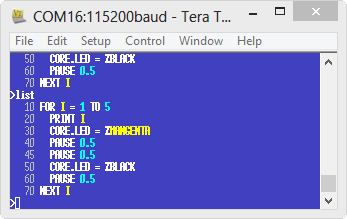 Other colors are accepted too (see below or the CoreBASIC manual). Creating a program on the fly is simple: it is entered line by line. 💡 Each line starts with a line number. To insert new lines, it is a good idea to increment line numbers by 10 (so I have enough lines as space in the program). 💡 Simply copy-paste the source lines into TeraTerm! Notice the %magenta in yellow color: here I have made spelling error. To correct a line I simply enter that line again. to delete a line: I use the delete command followed by the line number. 💡 The video on the SolderPage shows the usage of the accelerometer. 💡 make sure the TeraTerm view is big enough, otherwise the top line(s) of the source might not be visible. To exit the edit mode, use CTRL+D. 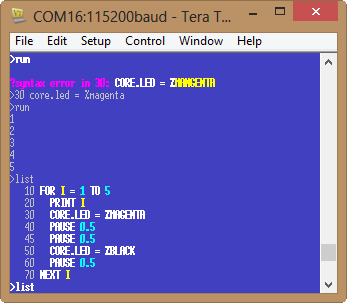 It is a great feeling: feels like I was young and programming with the Commodore C64. Maybe because of the blue background ;-). It is really fun to quickly type in something and to see how it goes. The only consideration is that there is not much RAM left, and that does not allow big things. 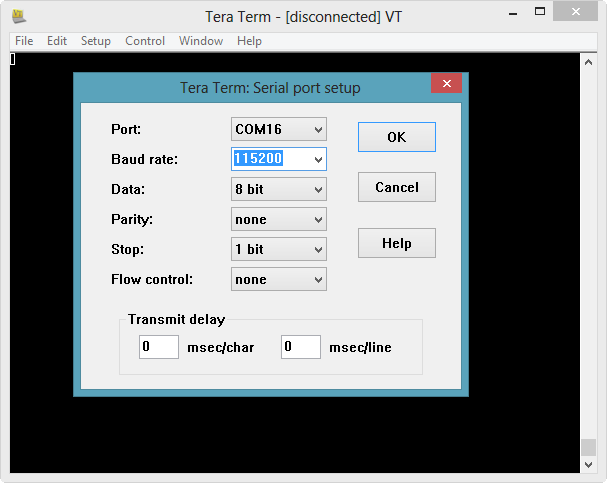 SolderCore demonstrates on larger devices with more RAM that a BASIC system can work with file system, ethernet and all the other goodies an embedded systems offers. On the CoreBasic site there is a cool demo video, plus www.soldercore.com/manual/ for the documentation, plus code examples I can try out. This entry was posted in KL25Z Freedom Board, Tips & Tricks and tagged freedom board, KL25Z Freedom Board, Tips&Tricks by Erich Styger. Bookmark the permalink.